Trump won four key battleground states (FL, NC, PA, WI). Unadjusted exit polls indicate that Clinton won all four and had 302 EV. But statistical analysis indicates Trump very likely won the four states. View the summary tables for 9 Battleground states below. Trump won the reported vote (party-ID) by 47.2-46.3%. Trump won the reported vote (gender) by 48.4-46.6%. I am not lobbying. I am an analyst. I proved the unadjusted polls were likely rigged. Hillary rigged the primaries: Bernie drew thousands; she drew hundreds. Hillary rigged the election: Trump drew thousands; she drew hundreds. No more status quo. People wanted change. They did not want WW III. She should have been indicted. The 2016 Election Model exactly forecast Trump’s 306 RECORDED EV. But millions of votes were stolen from him and Jill Stein. The True Vote Model forecast that he had 351 TRUE EV! Many analysts believe the unadjusted exit polls because they have always proved to be quite accurate. I proved systemic election fraud from 1988-2008 based on 274 state and 6 national unadjusted exit polls. I also proved that the 2016 primaries were fraudulent based on the unadjusted exit polls. So why the change now? Simple. The media (NEP) which funds pollsters were in the tank for Hillary. They had to show her winning the exit polls. In fact, I predicted that they would do so. The exit pollsters work for the MSM. The pollsters always force the unadjusted polls to match bogus recorded votes. So the ruse is nothing new. It just changed shape in 2016. Common sense tells us that Jill Stein did much better than 1% nationally. She probably had at least 5%. That’s 4 million more votes than she is given credit for. Where did they go? I am mathematically proving that the exit polls must be fraudulent because of persistent anomalies in the inflated HRC shares of Independents. Trump easily won the vast majority of Independents. Hillary’s share of Independents required to match the unadjusted exit polls are IMPLAUSIBLE. For details, read the eight IMPLAUSIBLE posts. I have come to the opposite conclusion. The exit polls weren’t rigged. The election returns were. They BOTH were rigged for Hillary. That’s my conclusion. I highly suspect you are dead on right about this Richard… makes sense that they rigged the exit polls again, only in a different way…. they rigged many of the pre-election polls too… underpolling independents and younger voters. I am so hoping these recounts exposes this… but we need at least some of the CA counties too…. and I agree with you, some of the states that HRC barely won. It makes sense some Stein votes were switched to Hillary where she can access to the machinery. She used this trick with Rocky, the third place-getter in the primaries. http://bit.ly/rocky2016-fraud Fractional voting was another tool they used. http://bit.ly/fraction-magic But the republicans weren’t clean. Voter suppression tricks, closing voting stations and slashing millions of minorities from the rolls in up to 28 states, using crosscheck. http://bit.ly/war-against-voters Which election scam had the greatest overall effect is yet unclear. Both parties do it and both want these illegal activities hidden, meaning CNN/Fox/MSM will never talk of it. The charade must continue although the veil is being lifted. To me it’s karma. Hillary stole her primary and Trump (strangely) didn’t steal his. This means Trump was the only ‘legitimate’ candidate left, hence no matter how vile, he deserved the win. Pity poor Bernie. I’m curious how the election could have been rigged for Hillary in the Republican-dominated states of WI, MI and FL? If the votes themselves were rigged, agents working for her election or the DNC would need access to (the computers that control) the machines. Could this happen in Republican states? And if the Hillary camp is rigging the election in her favor, why not actually win WI, she was only 27,000 votes short? Seems like a lot of trouble to go thru and still lose that state and an election. Its simple in 2008 and 2102 there were democratic districts that gave 100 percent all votes to Barack Obama Ohio and Pennsylvania had these ultra high democratic turnout. The main computer only totals what is sent it. In florida the same county gore disputed in his election was caught filling out absentte ballots..The rebpublican observer was kicked out, just like Obama used the courts in his election to do the same. Some districts in Obamas elections had his pic up which is illegal. Ok, I’m getting on board a bit late this time around. I can understand your reasoning in coming to your conclusion but its based on the shift in what these tables list as the Independent voter category. In virtually every state, the Dem and Rep voter categories have the Unadjusted and Reported vote count matching. The Independent category is all over the place? Now, I can see asking a voter in an exit poll what their affiliation is. How do you get this information for the Recorded Vote? In WI, we do not declare party affiliation when we vote. I don’t know what other states do but I’ll find out. Do you just assume the recorded vote and final exit polls will match and use the final exit poll affiliation for the recorded vote case as well? I’m sticking my neck out late but why assume the Dems rigged this thing. Could Republican affiliated poll workers or machine programmers have intentionally rigged CA and NY against Trump? They knew he would lose there anyhow. I’m been following this blog for years now and know enough math and statistics to believe you. I’m just not yet convinced that Hillary would have gotten a huge majority of the Independent vote as you are? A large number of people who declare themselves independent do not normally vote and Trump brought out a lot of them. 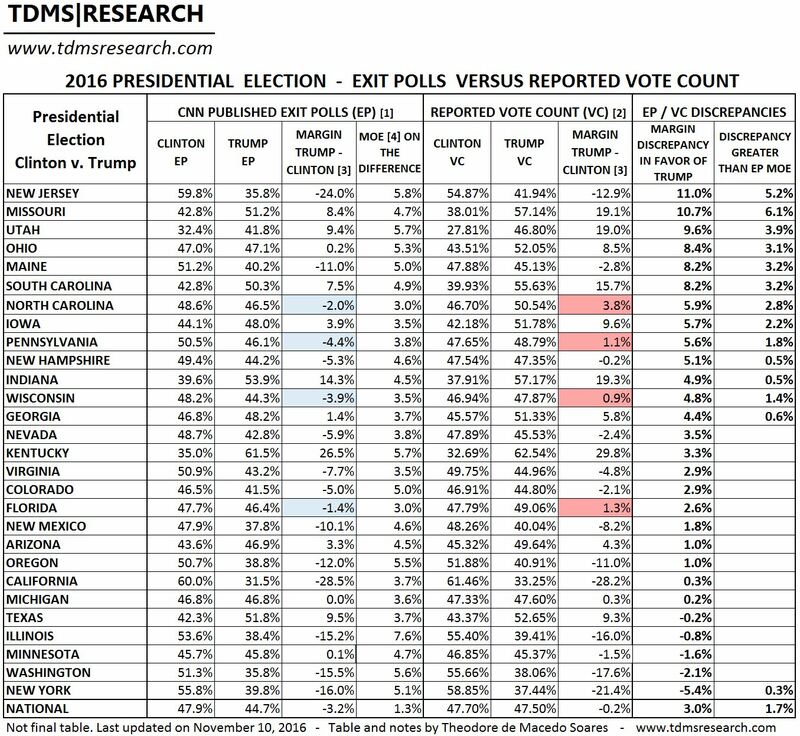 Trump had the vast majority of Independents based on the 9 final pre-election polls which were a close match to the recorded vote. The adjusted state exit polls which match the recorded vote give the vote shares for Independents. I believe they low-ball Trump’s share, but use them anyway to be conservative in calculating the True vote. I derive the 2016 state party-id based on the Gallup national voter affiliation poll. I assume the Dems rigged it all over based on the available evidence.